That's the highly-cited estimate out of Oxford by Frey and Osbourne of the percentage of existing jobs that are likely to be automated away with the help of technology within the next two decades. According to this paper, flip a coin and call heads or machines to see if your job will exist in 20 years. This is the 21st century fear for many called "technological unemployment." There does tend to be one caveat to this dismissal of automation fears -- that most of all of these high-skill jobs will require high-skill labor, and thus a highly-skilled work force which in turn will require more education. So of course the answer to what could otherwise be a somewhat thorny future, is simply education, education, and more education. Well, David Autor of MIT just published a fascinating paper (though we reach different conclusions) in the Summer 2015 Journal of Economic Perspectives titled, "Why Are There Still So Many Jobs? The History and Future of Workplace Automation." In this paper he compiled the following chart, and it should blow anyone's mind who holds a strong opinion about the historical effects on jobs by computing technology since it took off in the 1970s, and so the possible future we should expect if the trends continue. Second, the occupations that are losing employment share appear to be increasingly drawn from higher ranks of the occupational distribution. For example, the highest ranked occupation to lose employment share during the 1980s lay at approximately the 45th percentile of the skill distribution. In the final two subperiods, this rank rose still further to above the 75th percentile--suggesting that the locus of displaced middle-skill employment is moving into higher-skilled territories. 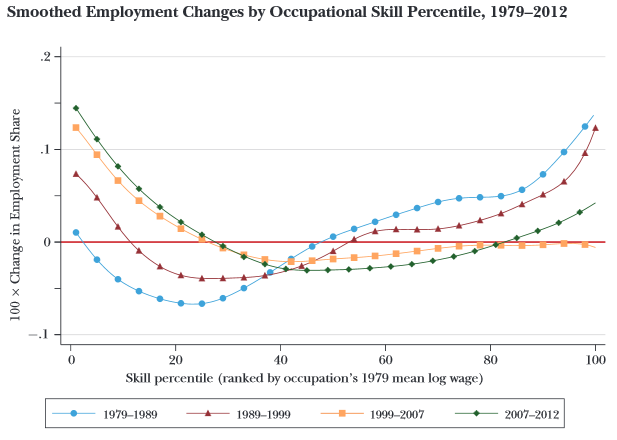 Where these curves intersect the red line has been moving to the right, meaning that more and more middle-skill jobs have been lost in a way that even increasingly eats into higher and higher skill ranges. This is a hollowing out of the middle and even upper-middle. Jobs that require what's considered between a low and high amount of skill have been disappearing. This appears to reflect the loss of the middle class. As each decade passes, the jobs that require mostly a medium amount of skill are simply going away, replaced instead with jobs requiring less skill, not more skill, and thus jobs that tend to pay less, not more. Their conclusion is unremittingly cheerful: rather than destroying jobs, technology has been a "great job-creating machine". Findings by Deloitte such as a fourfold rise in bar staff since the 1950s or a surge in the number of hairdressers this century suggest to the authors that technology has increased spending power, therefore creating new demand and new jobs. So there's no need to worry about technological unemployment, because there will always be a need for more bar-backs and haircuts? Is that bar-back better off no longer having a manufacturing job paying $40,000 per year and instead having a job paying $20,000 per year in the service industry? Is that an important job to the human species, bringing empty glasses from Point A to Point B? Is the job entirely voluntary or done out of need for income? And is this a job that just can't possibly be done by a machine, or outright eliminated? Ever? Is the service industry really safe? Special thanks to Steven Grimm, Arjun Banker, Topher Hunt, Keith Davis, Mark Witham, Albert Wenger, Larry Cohen, Joshua Grant, Chris Smothers, Danielle Texeira, Paul Wicks, Liane Gale, Jan Smole, Joe Esposito, Jack Wagner, Richard Just, Stuart Matthews, Natalie Foster, Chris McCoy, Michael Honey, Daniel Brockman, Gary Aranovich, Kai Wong, Peter Titus, Robby Olivam, John David Hodge, Louise Whitmore, Dan O’Sullivan, Robert F. Greene, Martin Jordo, Victor Lau, Shane Gordon, Paolo Narciso, Johan Grahn, Tony DeStefano, Andrew Henderson, Erhan Altay, Bryan Herdliska, Stephane Boisvert, Rise & Shine PAC, Kirk Israel, Luke Sampson, Lee Irving, Dave Shelton, all my other funders for their support, and my amazing partner, Katie Smith.